If blogs were scratch and sniff…you’d really be in trouble with this post. I found myself chanting the mantra, “Breathe through your mouth, not through your nose.” – while completely naked. Oh, sorry, I got ahead of myself; let me go back to the beginning. This was really the beginning of our Annapurna Circuit trekking. After spending a fun, memorable day in the little village of Puma, we put our packs on for the first time and actually started trekking. Since we had made a special visit to Puma, today we had to trek to meet back up with the official Annapurna trail. This meant we had to do some non-tourist trekking at first. 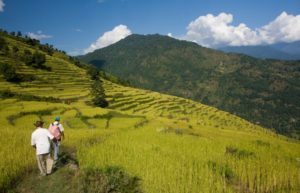 What’s non-tourist trekking? It’s the paths that the locals take. We started a massive descent down from the hilltop village, down the uneven steps. Step, after step, after step. I was taking in the beauty of the rice terraces and the diverse shades of green surrounding me and that’s when it happened. My dad fell. I was quite a ways behind him and I watched as Bishnu, and Deil, our guide and porter, rushed to help him get up. By the time I reached him, he was up and dusting himself off. We told him to sit down for a bit and relax. I looked at Bishnu and I could tell we were thinking the same thing; ”what was I thinking taking a 73 year old on the trail? !” Dad rested and was fine, but for me, that’s when things really got heavy. No, not my bag, but the stress that was weighing down upon my shoulders; the stress of responsibility for someone.